In this post, I have written about yet another strong and effective Vashikaran Mantra Prayog that is practiced by giving an Vashikaran Mantra Infused flower to the desired man or woman to smell in order to fascinate and bind that person under a Voodoo Love Spell of Enchantment. Even though, I had described some rare and unknown Vashikaran Experiments that make the use of a Mantra Abhimantrit Flower, I have still written about this particular experiment because in my opinion this is a most powerful Attraction Mantra because it contains the name of the Supreme Goddess Bhagavati Chamunda. The Vidhi of practicing this Mantra Prayog, which is called as the Phool Se Manchahe Stri Ya Purush Ko Vash Karne Ka Mantra in the Hindi language is most simple and uncomplicated. 1] The practitioner has to place any fresh fresh flower have a pleasant smell, like rose, jasmine, lily, lotus or any other flower have a nice smell before him and chant the Vashikaran Mantra given below 108 times, looking at the flower. The practitioner can use any kind of counting rosary. 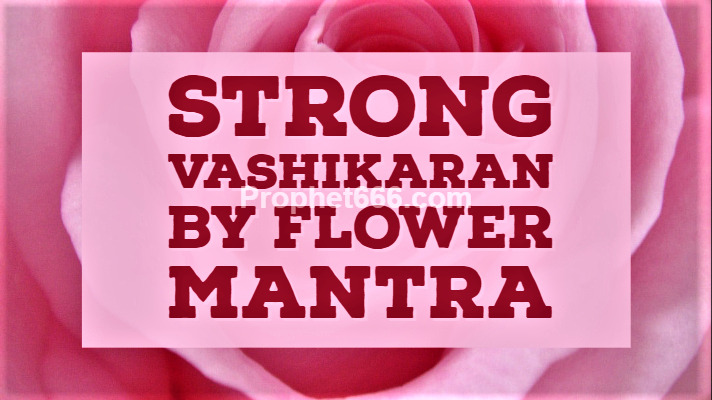 2] Then, the Vashikaran Mantra Infused flower has to be given to the desired man or woman to smell. As per the Vashikaran Tantra, once the target person smells the flower, he comes under the fascination spell of the practitioner. This is a onetime attraction experiment and success ultimately depends upon the intensity with which the experiment in practiced. However, it would be most appropriate to add that the practitioner should be realistic in his or her expectations. This attraction experiment should only be used for the motive love, marriage or friendship and not to cast an attraction spell for the motive of money, business or social or political favors. This Vashikaran By Smell Mantra Prayog can be practiced on any day and time and even though the Mantra names the Divine Goddess there is no special Puja-Vidhi or worship of the Goddess prescribed in the Tantra for practicing this Vashikaran Prayog. This means that the Vashikaran Prayog should be practiced by following the simple procedure described in this post. Sir i want something . I do something wrong and my deity reverse on myself .i have no idea left how to please her.